GitHub - Cartucho/mAP: mean Average Precision - This code evaluates the performance of your neural net for object recognition. 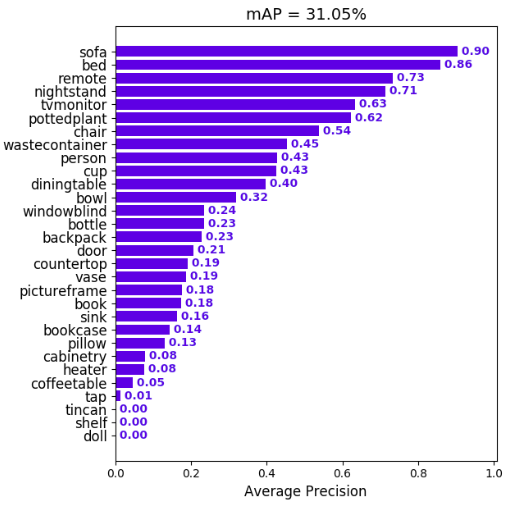 mean Average Precision - This code evaluates the performance of your neural net for object recognition. Want to be notified of new releases in Cartucho/mAP? This code will evaluate the performance of your neural net for object recognition. In practice, a higher mAP value indicates a better performance of your neural net, given your ground-truth and set of classes. The performance of your neural net will be judged using the mAP criterium defined in the PASCAL VOC 2012 competition. We simply adapted the official Matlab code into Python (in our tests they both give the same results). First (1. ), we calculate the Average Precision (AP), for each of the classes present in the ground-truth. Finally (2. ), we calculate the mAP (mean Average Precision) value. 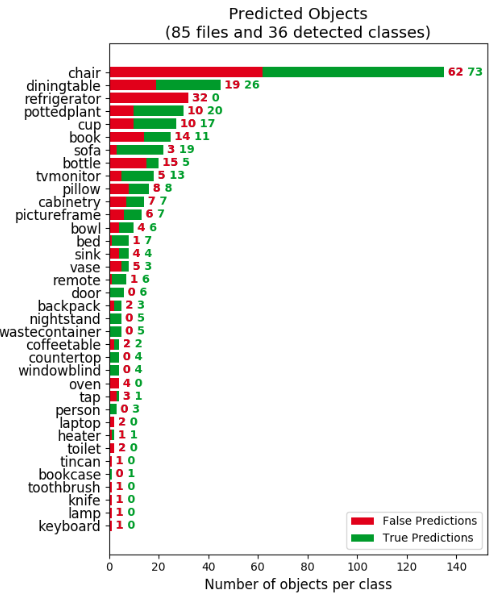 First, your neural net detection-results are sorted by decreasing confidence and are assigned to ground-truth objects. 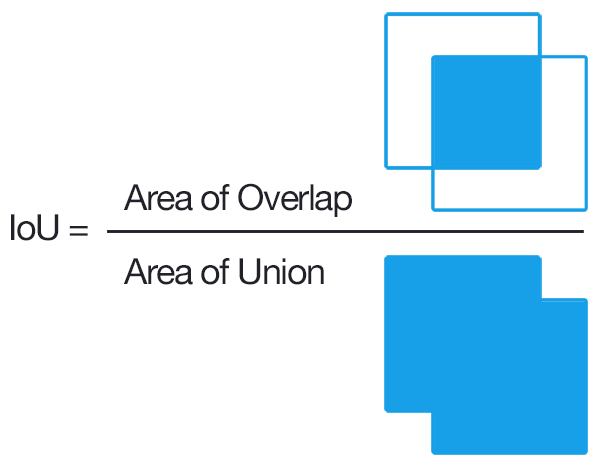 We have "a match" when they share the same label and an IoU >= 0.5 (Intersection over Union greater than 50%). This "match" is considered a true positive if that ground-truth object has not been already used (to avoid multiple detections of the same object). 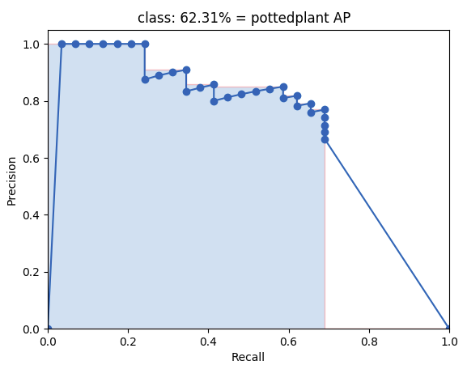 Then we compute a version of the measured precision/recall curve with precision monotonically decreasing (shown in light red), by setting the precision for recall r to the maximum precision obtained for any recall r' > r.
Finally, we compute the AP as the area under this curve (shown in light blue) by numerical integration. No approximation is involved since the curve is piecewise constant. In the scripts/extra folder you can find additional scripts to convert PASCAL VOC, darkflow and YOLO files into the required format. Create a separate ground-truth text file for each image. Use matching names for the files (e.g. image: "image_1.jpg", ground-truth: "image_1.txt"). The difficult parameter is optional, use it if you want the calculation to ignore a specific detection. Create a separate detection-results text file for each image. Use matching names for the files (e.g. image: "image_1.jpg", detection-results: "image_1.txt").